On the night of May 10th. Hitler Youth and right-wing students in 34 university towns across Germany marched in torchlight parades “against the un-German spirit” and called for Nazi officials, university faculty and chaplains, and student leaders to address the participants and spectators. 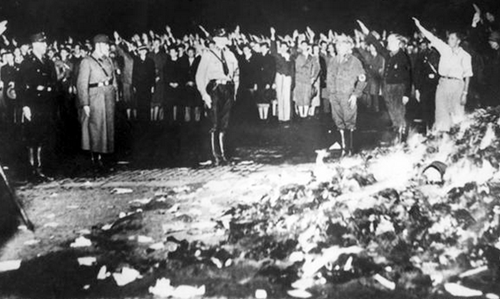 Then, singing songs and taking “fire oaths” as band music played, in large open-air bonfires, the students burned thousands of “un-German books,” taken in raids on public and university libraries, private collections, and bookstores. The events also received widespread media attention – not only newspaper coverage, but also “live” radio broadcasts of the songs and speeches. By the time of the book burning, Hirschfeld had long since left Germany for a speaking tour that took him around the world; he never returned to Germany. On his 67th birthday, 14 May 1935, Hirschfeld died of a heart attack in his apartment at the Gloria Mansions I building at 63 Promenade des Anglais in Nice. 76 years later on August 2011, the Federal Cabinet of Germany granted 10 million euros to establish the Magnus Hirschfeld National Foundation (Bundesstiftung Magnus Hirschfeld), a foundation to support research and education about the life and work of Magnus Hirschfeld, the Nazi persecution of homosexuals, German LGBT culture and community, and ways to counteract prejudice against LGBT people.